At the moment I’m on the last leg of my knitting as the Mira Cowl is almost finished. That’s really code for I’ve nearly run of yarn. But it’s good when the yarn makes the decision for you! At other times I’m enjoying picking up my new ripple to work on a row or three, though when my fingers become crampy I throw it back in the Seasalt bag, where it’s stored. I hadn’t realised until yesterday that I’d picked one which coordinates beautifully with this blanket. I’ll take a pic of it sometime. I’m still trying to think of a name for this ripple. Any suggestions? It’s for a friend who likes purple and green. I felt a bit like a crochet desperado when I asked if she wanted one, but although I’d vowed this wasn’t going to turn into another year of blanket making, like the last, I was really missing having something easy I can do while I sort of watch TV. That reminds me: have you seen The Dressmaker? I had to put the ripple down on Sunday after I realised I was missing lots of detail, particularly the superb costumes. It’s a great film. You think it’s simply eccentric which has become rather conventional, then it turns to be quite darkly funny and goes off in an unexpected direction. 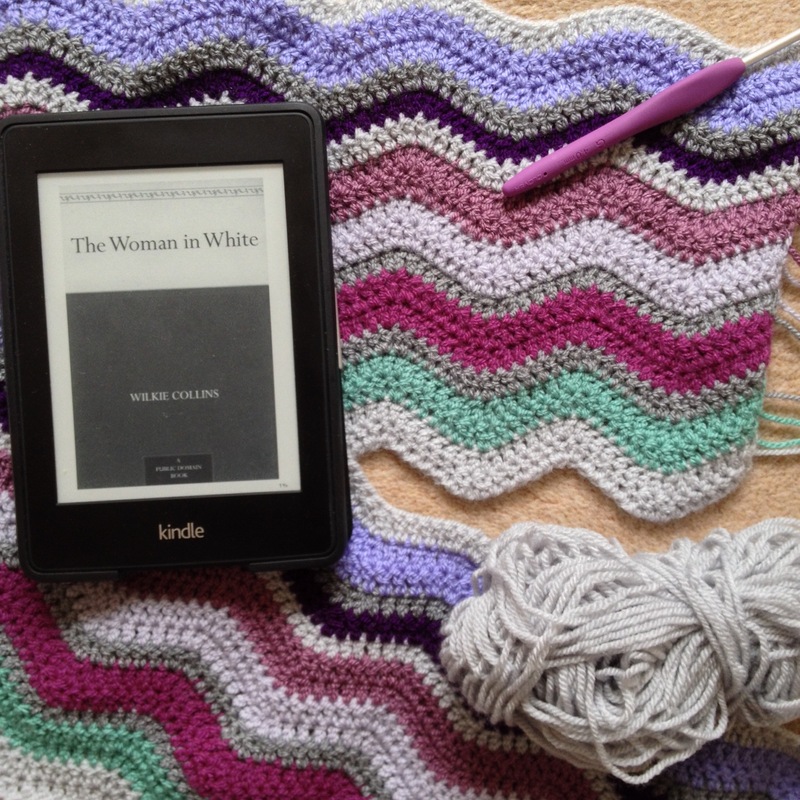 I’ve just started reading The Woman in White which I’d added on my Kindle, along with other free classics last year. Written in 1859 it’s a surprisingly good read. I’ve got to the second narrator’s account and am curious as to what will happen. I think we all trust the dog’s reaction to X though, don’t we? I’m joining in with Ginny again. Thanks Becca. It was from LoveFilm by Post – far more preferred films and tv there. The Woman in White is a brilliant read. I loved it. The first colours in your ripple reminded me of candyfloss but if its going to be mostly purple and green then how about lady in lavender! Isn’t that a euphemism for something? I enjoyed “The Woman in White” very much; have read it a couple of times. Interesting what you say about offering to make a blanket. I offered to make one for my son for a similar reason but he turned me down! Looking good! And I love the idea of the Yarn Along, I might do that too!